Dark chocolate is considered a "cheat" food by many individuals, but there actual health benefits from eating a moderate amount. It does contain a significant amount of magnesium, a mineral your body needs for a variety of functions. However, dark chocolate is still high in fat and sugars, so you should eat it only in small amounts. Dark chocolate is made from cocoa beans. The beans are removed from the pod and go through a process that results in cocoa solids -- also called cocoa liquor -- which is a condensed form of cocoa. Cocoa liquor can be processed to make cocoa butter, or it can be made into a cake, which is then ground into powder. While most cocoa liquor then has milk added to it to make chocolate, dark chocolate has no added sugar and little added milk, and should contain 60 percent or higher of cocoa solids. Magnesium is one of the most abundant minerals in your body, with more than 50 percent of it located in your skeleton. According to the National Institutes of Health, it is involved in more than 300 chemical reactions in your body, particularly those involved in the metabolic process that converts food to energy. Magnesium is also necessary for your muscles and nerves to function correctly -- including regulating your heart rate -- and it helps your immune and skeletal systems stay strong. 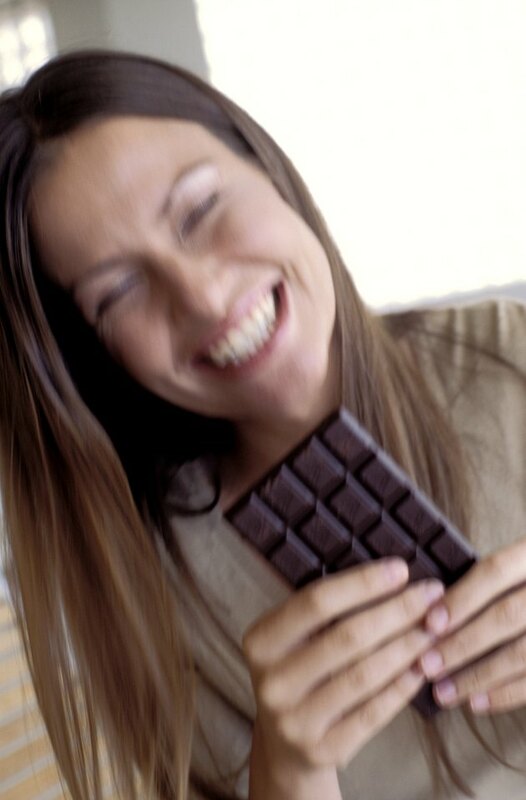 Dark chocolate is fairly high in magnesium, with 176 mg in a 100 g serving. This is around half of your daily recommendation. Adult males ages 19 to 30 need 400 mg daily, while men 31 and older need 420 mg. Adult women ages 19 to 30 should get 310 mg every day, while women over 31 need 320 mg. Other good sources of magnesium that are lower in fat and sugar than dark chocolate include green leafy vegetables, legumes, nuts, seeds and whole grains. The University of Michigan Health System recommends consuming 1 oz. of dark chocolate every day, due to its health benefits. Dark chocolate contains a group of antioxidants called flavonoids, which can help your heart health. It can help lower your LDL cholesterol, reduce your risk of blood clots and increase blood flow through your arteries and heart. However, consume dark chocolate in moderation, since it contains caffeine and it can be high in fat.